Check out our Featured College Football Free Picks for similar articles. 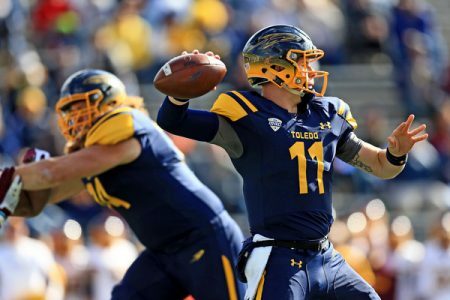 Ohio vs. Toledo Football Free Pick, a prediction for the total and the spread for this MAC clash at Glass Bowl in Toledo, Ohio Thursday night. These teams last met in 2010 and Toledo won that game 20-13. Toledo opened as a 16.5-point favorite but are as of Wednesday favored by an even 16 points. The Rockets are 3-1 ATS at home this season but the visiting Bobcats a perfect 4-0 ATS on the road. The total opened at 58.5 and that’s still the case as of the publication of this article. The over is 3-1 in Toledo’s home games this season but 0-4 in Ohio’s on the road. The Bobcats have been putting up decent results without impressing as they head into the game with a 5-3 record with wins in four of their last five games. They won 14-10 at Kent State as a 1-point favorite last week as they held their opponent to a total of just 264 offensive yards. They did only put up 345 yards themselves though and were forced to overcome three turnovers. Bobcats are 4-0 ATS in their last 4 Thursday games but just 17-39-1 ATS in their last 57 games after scoring less than 20 points in their previous game. Under is 7-0 in Bobcats last seven games overall. The Rockets are arguably one of the best college football teams in the MAC and hed into the game with a 6-1 record. They’re coming off a 31-17 home win as a 10-point favorite versus Central Michigan despite leading by just a field goal at halftime. QB Logan Woodside connected with Cody Thompson for four scores, and Woodside has had a very strong year so far throwing for 2277 yards with 22 TDs and just four INTs. Rockets are 4-0 ATS in their last 4 Thursday games and 9-1-1 ATS in their last 11 games after allowing less than 20 points in their previous game. Under is 8-0 in Rockets last eight home games vs. a team with a winning road record. The Bobcats will face a much tougher offense than last week, but their D is stingy and we think they’ll keep this a relatively close game that goes under the total.